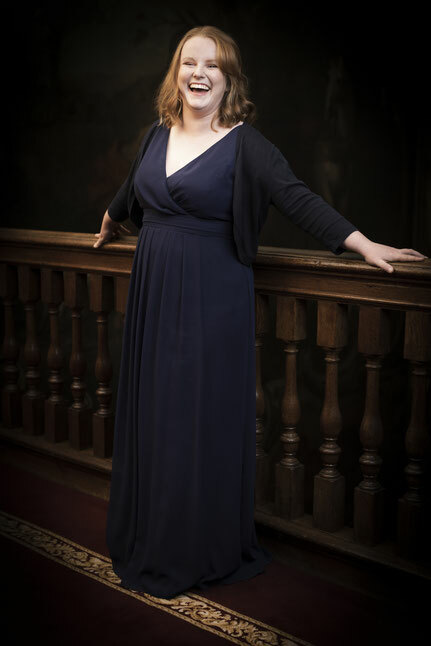 "Then Harriet Burns, Oxford lieder’s Young Artist Platform winner, happened to be in Oxford. and happened to know Weir’s Nuits d’Afrique – probably the only person in the country, as Kynoch pointed out, who had this 2015 song cycle under her belt and ready to go. She sang it terrifically, with heart and humour." "Harriet Burns lightened the room with her bright and expressive singing and is surely a name to look out for. She was joined by pianist James Baillieu, cellist Brian O’Kane and flautist Adam Walker." "Harriet Burns shone in The Alps, Judith Weir's cool and succinct setting of words by Emily Dickinson"
"Setting Emily Dickinson, Judith Weir’s The Alps features the astonishingly pure soprano of Harriet Burns...Golijov’s Sarajevo, a setting of a Sephardic folksong, found soprano Harriet Burns clear and powerful against a busy surface provided by clarinet, viola, cello and double bass." "Soprano Harriet Burns struck just the right tone of tremulous excitement in Offrandes, a setting of erotically surrealist poetry, the ensemble and conductor Geoffrey Paterson touching in a nocturnal soundscape behind her." "With soaring control of line and fine articulation, the soprano Harriet Burns made the case here (Un Grand Sommeil Noir) and in the symbolist Offrandes for the unlikely notion of Varese as a lost song-writer in the French tradition"
"(Un Grand Sommeil Noir) was touchingly conveyed by Harriet Burns with Sebastian Espinosa Carrasco... Offrandes finds Varese setting texts by two Spanish surrealist poets in music whose alluring yet menacing aura was tellingly complimented by Burns's vocal agility"
"It was most beautifully sung by the soprano Harriet Burns, accompanied by the pianist Sebastian Espinosa Carrasco"
"After watching a few singers whose message seemed to be, "It's all about me!" it was refreshing to hear Harriet Burns and Ian Tindale, who clearly were there to show off the beautiful music they were performing and not themselves. Burns’ singing is comforting to listen to, and the communication between the two players was a beautiful thing to watch." "The two highlights with the most nuance came just before the that sequence from the Norwegian tenor Eirik Grotvedt in a rapt "Nachtlied" and engaging lyric soprano Harriet Burns charting the secret rapture of Wolf's "Anakreons Grab"." "Harriet Burns is a triumphant comedienne as the over-confident schoolgirl Emmie Spashett." "...the excellent Harriet Burns who – in her role as one of Jove’s entourage – supplied the voice of the false Diana..."